The Kansas City region’s employment level topped the 1,010,000 mark in July as the economy added 2,500 jobs. This is up by 13,600 from July 2012. This also marks the highest employment level we've seen in the metro since November 2008, when the economy was in free-fall. Local employment growth seems to be concentrated in two industries, professional business services and leisure/hospitality. Despite the increase in employment, the region’s unemployment rate remains stuck at 6.6 percent because the labor force growth has recently been keeping pace with employment growth. 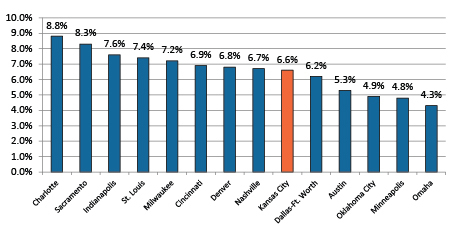 Even though our unemployment isn't changing, we're still positioned well among our peer metros. Of the 13 other metros we track, only five (Dallas-Ft. Worth, Austin, Oklahoma City, Minneapolis-St. Paul and Omaha) have lower rates. Along with increasing employment, there is a significant increase in the number of help wanted ads. More than 15,000 unique ads were posted in the Kansas City area in July, the busiest month for such activity this year. So, we'd give the region's economy good overall grades on many fronts this month. Employment growth is plodding, but appears solid; the labor force is growing as well. Job posting activity also appears to be fairly robust. These are all pretty good things, and there even more reasons to feel positive about employment growth in the region going forward. We expect to see increased employment at the auto plants as their planned expansions come online. Several recent announcements of new construction projects coming downtown (apartments, a hotel and the streetcar) are encouraging. And speaking of construction, the housing market has been quietly heating up, which will undoubtedly lead to more new home construction. It has been a long time in coming, but Kansas City’s employment may finally be standing on solid ground and looking toward an optimistic future. 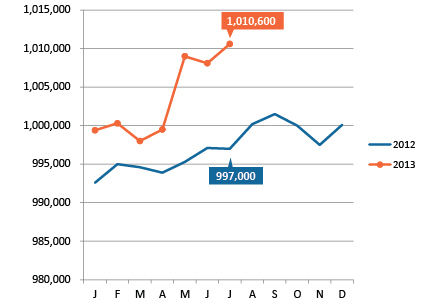 Local employment topped the 1,010,00o mark in July. Overall employment is up by 14,000 form one year ago. 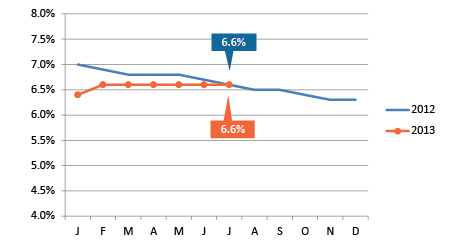 The seasonally adjusted unemployment rate held steady at 6.6 percent for the sixth month in a row. With our unemployment rate stuck at 6.6 percent, we remain firmly in the middle of the pack compared to peer metros. 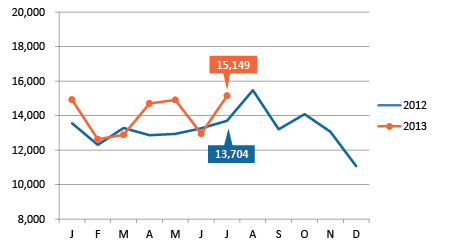 Job postings rebounded in July to 15,149. Please join the Mid-America Regional Council for the 2013 Economic and Workforce Development Summit on Oct. 25 at the Kauffman Foundation Conference Center. MARC will present an annual economic report on the Kansas City region’s top industries and occupations. We also discuss workforce and economic development priorities with Kansas City leaders. • KC Economic Forecast and State of Workforce Report from Frank Lenk, MARC's director of research. • Ignite presentations from area industry leaders in manufacturing followed by discussion with participants. • An update on the region's information technology industry from Ryan Weber, president of KCNext. • A panel discussion on Kansas City entrepreneurship with key players from Kansas City Start-Up Village, including Local Ruckus, Leap2, Handprint and SportsPhotos.com. The $30 registration fee includes breakfast. Register online or call 816/701-8234.